This is the first part of the two-part feature covering the history of the Bell Aircraft Corporation X-1 series of experimental supersonic aircraft. Part two can be found here. The Bell X-1 and Chuck Yeager will always be remembered as a formidable combination. The most famous photograph of them all, showing the X-1-1 Glamorous Glennis at altitude with the rocket engine on, displaying visible shock diamonds in the thin air. Chuck Yeager is at the controls, and the date is October 1947. In the aeronautical industry, the problem of high speed flight was of relatively academic interest until the mid-1930s. Two technical developments of immediate pre-war years brought the area into the spotlight. The first one was the appearance of the jet engine. Although no engines suitable for practical use were yet available, the potential of jet propulsion for high speed flight was quite apparent. The second development, the introduction of powerful, streamlined monoplane fighter, brought a series of mysterious accidents involving high speed dives. 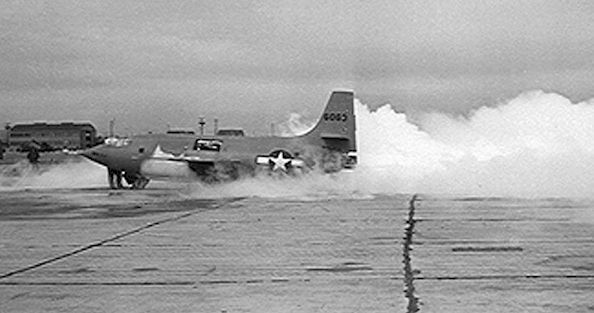 The phenomenon became known as compressibility - shock waves of compressed air causing the airframe to disintegrate. Earliest traces of such accidents go back to 1937 with the Messerschmitt Bf 109. Eventually scientists identified the reason for the problem. The name "sound barrier" was born - it was actually seen upon as an actual physical barrier that would have to be overcome. Equally important, the barrier was also psychological - there were many voices arguing that supersonic flight would be impossible. An interesting evidence of the doubt is that even at the time of the first supersonic flight, the Mach meter of the X-1 was still only calibrated to 1.0! Breaking the sound barrier required solving the propulsion challenge as well as the aerodynamic challenge in a single aircraft. The aerodynamic challenge had many grave difficulties -- establishing what happens to an airplane as it accelerates through the speed of sound. As it catches up in flight with its own pressure waves, the airflow conditions around the airplane would change completely. There was a great effort in studying the phenomena of what was called transonic flight - transition between the subsonic and supersonic speed. Wind tunnel technology at that time did not offer accurate and reliable results for transonic speeds. To research the area, the British and American governments decided to develop specialized research airplanes that would be used as flying labs - to record and take data on flow conditions at transonic speeds. In effect these airplanes were to be research tools using the sky as a laboratory. In Great Britain, the research program was managed by Miles aircraft but was dropped due to financial difficulties immediately after the war. In the United States, a program called XS-1 (Experimental Sonic One) was initiated in 1944 by USAF and NACA. The X-1s fuselage was shaped after the 0.50 calibre machine gun bullet. For its time., it was a masterpiece of streamlining. Interestingly, both the British and the American projects arrived at the same aircraft configuration. According to the contemporary state of aeronautical science, the contours of projected aircraft were shaped after the lines of a machine gun bullet. The decision to adopt this shape allowed to utilize research on high-speed aerodynamic qualities of munitions done several years before. Besides ballistics, very little was actually known. In the absence of reliable wind tunnel data, falling back on the known and well-proven shape provided a degree of confidence. Bell Aircraft Co. in Buffalo, NY was awarded a contract for three prototype aircraft in March 1945. Soon the "S" was dropped from the designation of the project and the resulting aircraft was known as the X-1. The X-1 was in principle a bullet with wings. The pattern shape was followed to the point of removing a canopy. Instead, the pilot sat behind a sloped, framed window inside a confined cockpit in the nose. To today's onlookers, the X-1 has a markedly stubby look, but in 1947 it represented state-of-the-art in streamlining. The airframe was also very small, being only 31 feet long and had 28-foot in wingspan. 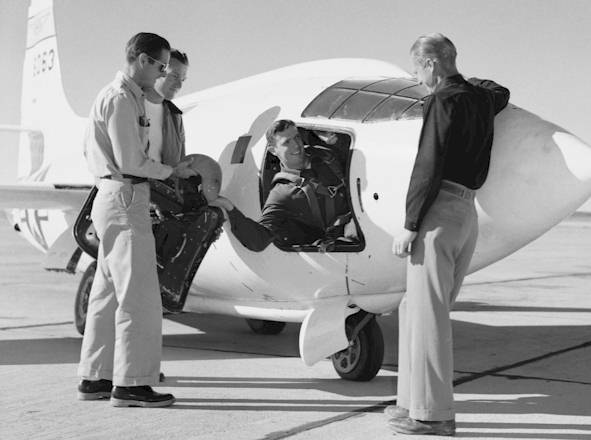 One serious consequence of the cockpit design was a completely inadequate escape provisions. The pilot entered the machine through a small hatch on the port side of the nose. There was no ejection seat, and no other emergency exit from the plane. In the bail-out situation, even if the pilot managed to climb out of the cockpit, he would be thrown behind onto the wing leading edge with fatal consequences. Pilot's entry to the cockpit was cumbersome to say the least, as proved by this photograph. Leaving the plane in emergency could be a nightmare, a fact sadly experienced by Joseph Cannon on X-1-3. The project team realized that the X-1 was a very dangerous airplane. After being assigned to the program, Chuck Yeager was called by Colonel Boyd who said "You know, we've got a problem. I wanted a pilot who had no dependents.". Chuck responded: "I, yeah, I'm married and I, I've got a little boy, and I, I think that makes me more careful." The explanation worked, and as we all know, Chuck Yeager was allowed to fly the aircraft. The wing was straight (the advantages of swept-wing design for high speed aircraft hadn't become known to the Americans before the fall of Germany. By that time, the prototype construction was well underway), but very thin, its maximum thickness being only 10% of the chord. The lesson continually learned during the X-1 was that high performance wing design should emphasize thin wings and low aspect ratios, and the thickness was eventually reduced to 4% in the X-1E. The all-flying tail of the X-1A. The horizontal tail was mounted high on the fin to avoid it being affected by the turbulence from the wing. A novelty was the all-moving horizontal tail. When approaching the speed of sound, an aircraft develops a shock wave. Behind that shock wave there is a "dead water" speed range, in which ordinary elevator control becomes extremely ineffective. The effect was already known from World War II fighters. 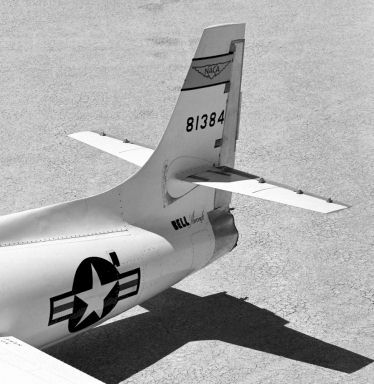 As sufficient aerodynamic data were not available, Bell developed a precautionary backup in which the entire tail plane could be moved as an emergency measure. The solution worked so well that it was later adopted as standard on all supersonic aircraft. It also became a well-guarded military secret, accounting in significant part for the ascendancy of F-86 Sabre over Mig-15 during the Korean conflict. Despite its small size, the aircraft was very rugged and capable of withstanding enormous forces. The airframe was constructed from high-strength aluminium, with fuel tanks welded from steel. Reportedly, the X-1 was a delightful airplane to fly. It had the handling characteristics of a fighter and it was very agile. None of the test pilots expressed any complaints about its flying qualities. Inside, the fuselage was extremely crowded with the pressurized cockpit, fuel tanks, pressure tanks, undercarriage and test instrumentation. 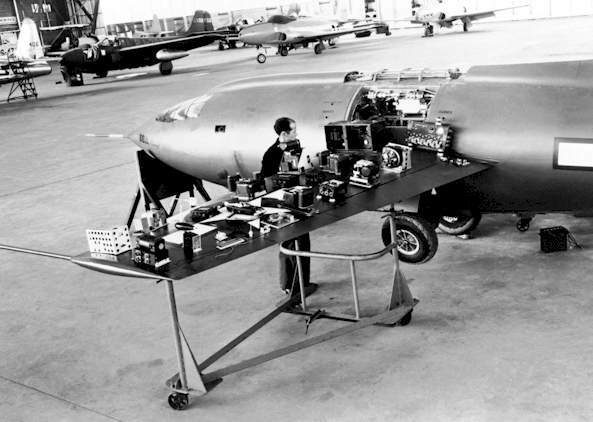 The fuselage of the X-1 was extremely crowded with equipment. 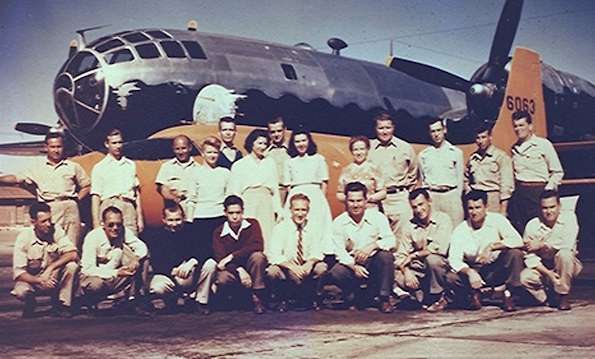 The precise date of this photo is uncertain, but it is probably before 1948, as witnessed by the orange paint scheme. In the background there is an interesting array of early U.S. jets: Lockheed P-80 Shooting Star (two of which were used as chase planes on X-1 flights), Bell P-59 Airacomet, and a tail of the prototype Republic XP-84 Thunderjet. A decision was made early to power the design with a rocket engine. This choice was made to shorten the development time and avoid some inevitable problems. Jet engines of the period were still in their infancy. First of all, no jet engine available had the potential of providing the thrust necessary to push the airplane into the region of the speed of sound. Secondly, there would be aerodynamic problems of providing proper airflow to the engine during the transonic flight. The selected powerplant was the Reaction Motors XLR-11 rocket engine. Actually it was rather a set of four independent engines coupled into a single unit. The engine provided 6000 lbs of thrust. It burned liquid oxygen and a mixture of five parts alcohol to one part water. There was enough fuel for 2,5 minutes of flight with all four chambers lit. Operating the engine was a simple affair. There was no throttle control. The pilot could just select each of the four chambers either on or off. 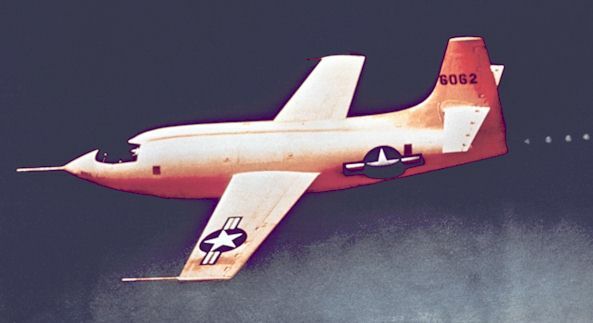 The X-1 accelerated very, very rapidly. Pilots' experience was "like being hit in the back with a lead boot." The engine worked until it ran out of fuel. After that the pilot would glide back to the landing ground. Test-running the engine was an unnerving experience because of the ungodly noise which caused the ground to tremble. Like with its German predecessor, the Messerschmitt Me 163, the volatile fuels were very hazardous and a constant source of concern. Because of that it was strictly forbidden to land the aircraft with remaining fuel onboard; provision was made to jettison fuel in the air. Despite all precautions, half of X-1s produced were lost in fuel explosions. This photograph gives a good impression of the experience of the ground engine test. The aircraft is X-1-2, still in the orange paint scheme, which dates the photograph to 1947. Note the large frost patch forming on the lower fuselage in ahead of the wing. It was caused by the liquid oxygen propellant housed in the main fuel tank.